Christmas tree production has become a lucrative farming business in the foothills attracting more and more growers. The UC Cooperative Extension Farm Advisor, Lynn Wunderlich has ongoing research projects working with local growers planting different exotic species of firs to determine trees that are less susceptible to pests and diseases. Read the featured story UC Studies New Christmas Tree Species in California to find out more about these Christmas tree species. Christmas Tree Cost Study 2005 By Lynn Wunderlich, Farm Advisor, University of California Cooperative Extension, El Dorado and Amador Counties; Cindy Fake, Farm Advisor, University of California Cooperative Extension, Placer and Nevada Counties; Karen M. Klonsky, Economist, University of California Cooperative Extension, Department of Agriculture and Resource Economics, UC Davis; Richard L. De Moura, Staff Research Associate, Department of Agriculture and Resource Economics, UC Davis. 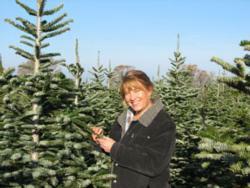 Sample costs to produce a choose and cut Christmas tree farm.